Michael James Smith was born in Southend-on-Sea Essex on 22nd February 1976. The second son of the British landscape artist, David Smith. 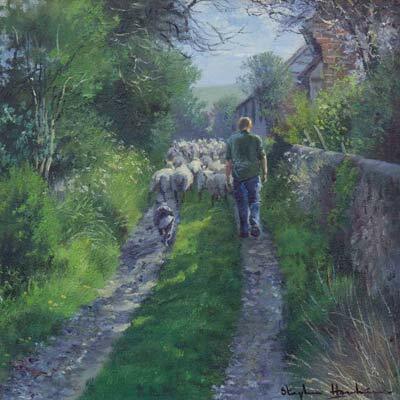 In stark contrast to his father’s early life, for as far back as Michael can remember, he was immersed and surrounded by artistic endeavour as his father worked in his studio and often when seeking inspiration and scenes for his paintings, he would take Michael on trips to the countryside, into areas of outstanding natural beauty. A young boy walking the hills and dales of Britain with vistas seldom seen by most, has left him with a deep and abiding love of this country from where his artistic talent was to emerge and blossom. Throughout his school days, Michael excelled in drawing, painting and other art-related subjects. At the age of seventeen, he achieved a place at the Southend College of Art and Technology to pursue his initial desire to train as an architect. When in 1993, quite by chance, he decided to attend one of his father’s exhibitions at Harrods Picture Gallery to witness, at first hand, the response from the public, the respect, admiration, pleasure and delight expressed by strangers to his father’s paintings, changed Michael’s viewpoint and the realisation dawned that dear old Dad was indeed a Master. During the following two years at college, Michael began to identify more strongly with the idea of becoming a professional artist having identified the genre he wished to pursue quite naturally, ‘landscape art’. This idea not being met with much enthusiasm from his father who wanted him to complete his studies having been denied the opportunity when he was a young man. However, being a realist, he relented allowing Michael to set up his easel alongside his in the studio and to cut his first professional canvas at the age of nineteen. 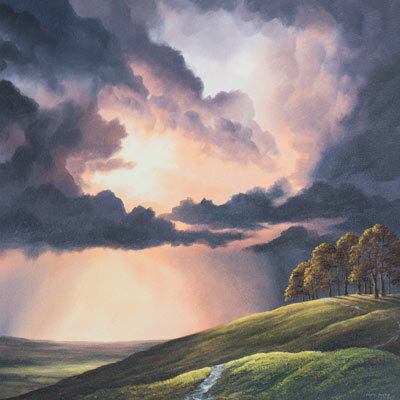 Michael James Smith completed his first painting in four weeks. A local gallery accepted it on sale or return; before he arrived home from the gallery, it was sold. This initial success was followed when shortly after a gallery in Leatherhead, Surrey agreed to display some of Michael’s works. Within a few weeks the gallery began to purchase all of his paintings as demand began to outstrip supply. 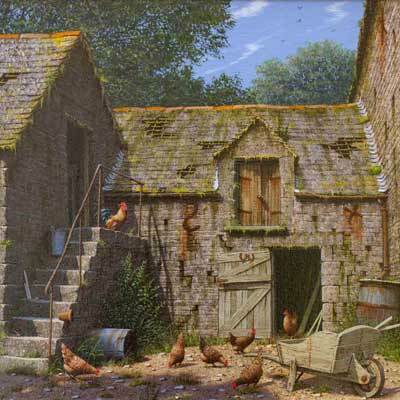 This has been a continuing aspect throughout his highly successful career with an ever-increasing international client base with over half of his annual output being sold in the U.S.A. His contemporaries, appreciative clients are aware he is on track to become one of Britain’s foremost landscape artists. 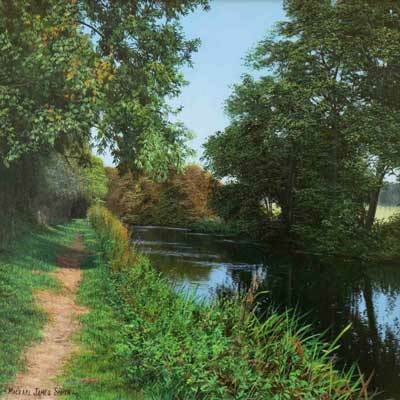 One of the most striking features of Michael’s work, as he strives to impart the rich colours of the British countryside onto canvas, is the unique detail present in each painting, often featuring a lowland stream, its glassy reflection an indication of Michael’s ability for intense observation. This comes from within, a feeling borne out of a deep respect for the countryside and that he is engaged in chronicling the history of the landscape at the beginning of the new century. 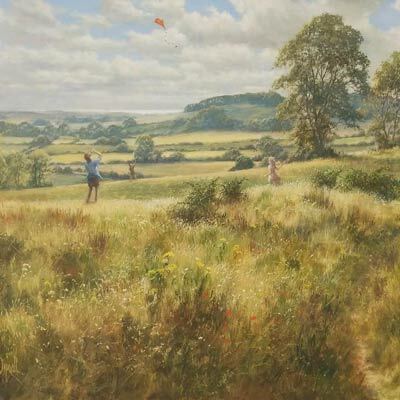 Of something so fragile and about to change, his ability to interpret the sublime beauty of the English meadow or riverside scenes may be the only record of what Britain used to look like at the turn of the next century. Michael James Smith has been heralded as “Britain’s next top artist” by Artists & Illustrators and the quality of his paintings is unquestionable.